On February 20, WorldBoston invited Thomas Bollyky to their second Chat & Chowder event of the season. As with every Chat & Chowder, guests were invited to listen and learn about topics affecting our global society, while enjoying some delicious New England clam chowder. This week’s international affairs topic focused on global health. Mr. Bollyky, author of Plagues and the Paradox of Progress, explained what could be possibly worrisome about an increasingly healthy world. Paradoxical as it may sound, Mr. Bollyky identified that since the world is becoming increasingly healthier, it’s leading to byproducts in emerging and developing cities, like an increase in young adult population and a shift in urbanization. Population is rapidly growing within these emerging cities, and infrastructure and jobs can’t keep up. Mr. Thomas Bollyky received his B.A. from Columbia University in Biology and History, and his J.D. from Stanford Law School. He currently works as the Director of the Global Health Program at the Council on Foreign Relations (CFR). The CFR’s Global Health Program provides “independent, evidence-based analysis and recommendations” that help leaders and professionals internationally address health challenges across our globalized world. At the CFR, Mr. Bollyky had the opportunity to direct the first Independent Task Force focused on global health. In addition to working in the Global Health Program, Mr. Bollyky is also an adjunct professor at Georgetown Law. Mr. Bollyky kicked off his talk with a number of statistics showing our world becoming increasingly healthier. The rates of infectious diseases are rapidly falling across the board. Niger, for example, has added 21 years to their life expectancy since 1980. Child mortality in Niger has declined over 70% and healthcare is approx. $17 USD per person. Historically, improvements in sanitation played a pivotal role in the drop of mortality rates. Not until after the 1900s did most U.S. city inhabitants have access to clean and filtered water. Increased sanitation, housing laws, and public health reform allowed cities to grow and mortality rates to drop. This included child labor laws, social regulations, and compulsory immunizations. The United States and Europe saw the byproducts of better health lead to prosperity and a growing economy, paving the way for Europe and the U.S. to become the countries they are today. With this increase in health in Niger, it was expected to see the improved health spur broader benefits, similar to those of U.S. and Europe. However, due to the rapid increase in population over such a short period of time, developing countries like Niger have not seen the same improvements. The drop in child mortality rates has led to an increase in the young adult population of many developing countries. One would expect with more working age young adults, there would be more individuals contributing to their country’s economic development. Unfortunately, many of these young adults in Niger are leaving their country at a rapid rate. Migration increased to over six million in 2013, and is projected to increase to up to 34 million by 2050. Young adults are leaving Niger for multiple reasons, most significantly because of a lack of available jobs. Niger is unable to keep up with their rise in working-age population, and can’t offer enough jobs to get their citizens to stay. Due to health improvements, poorer and poorer counties have been able to urbanize. But, the rate of urbanization is 2-3x what has been seen in the past. This is where the paradoxical relationship between health and development comes into play. Rapidly urbanizing cities have become victim to overcrowding with limited infrastructure to support the growth in population. For example, the city of Dhaka in India is one of the most densely populated cities in the world, home to over 16 million inhabitants. The average driving speed in Dhaka is only slightly above the average walking speed, taking city inhabitants hours to get to work. According to the World Bank, Dhaka city residences loose up to 3.2 million working hours per day due to congestion. This makes it harder to start businesses, and makes residents poorer rather than richer. Developing countries also struggle when combatting emerging diseases. There are many gaps in the health systems of emerging countries. The Ebola outbreak affected countries like Liberia, Sierra Leone, and Guinea, and caused many fatalities. Although those countries were actively doing well in the global health spectrum, they struggled to handle emerging diseases like Ebola. Emerging and developing countries are also struggling when it comes to noncommunicable diseases. These diseases are increasing rapidly in many developing countries, especially among younger people. Mr. Bollyky explained that in 2013, over eight million people under the age of 60 died from noncommunicable diseases. Improve Education: We need to invest in young adults, because they are young and growing fast! This is the “age of miracles,” where we can reduce child mortality. Now, we need to provide these children with opportunity to grow. Voluntary Family Planning: By providing voluntary family planning and reproductive health care, this can help families control the amount of children they are having. Due to the increase in child mortality, families can have less children and a more likely chance for those few children to survive. Extend the Reach of Healthcare Programs: Governments need to invest in quality health programs for their citizens, and try to keep up with their rapidly growing population. At the conclusion of his talk, Mr. Bollyky opened the floor up to questions. Many attendees asked about the young adult population, and how developing countries can handle their growing population. Mr. Bollyky explained that developing countries must invest in young adults, because they are young and growing fast. Educating the young adult population is important. It also is important for developing countries to establish a functioning health system, especially for noncommunicable diseases. A functioning health system can help educate young adults on healthy habits like tobacco control. Mr. Bollyky also addressed a question on foreign aid and whether it worked. He stated that aid works for global health, even if there is corruption within the government taking the aid. WorldBoston will be hosting many upcoming events, including their State of the State Department and Diplomacy on Thursday, March 7th from 6-7:30 PM. A Great Decisions event will be held on April 4th from 6-7:30 PM on Refugees and Global Migration, and their third Chat & Chowder of the season on Trade and American Leadership will be held on March 26th at 6:00 PM. 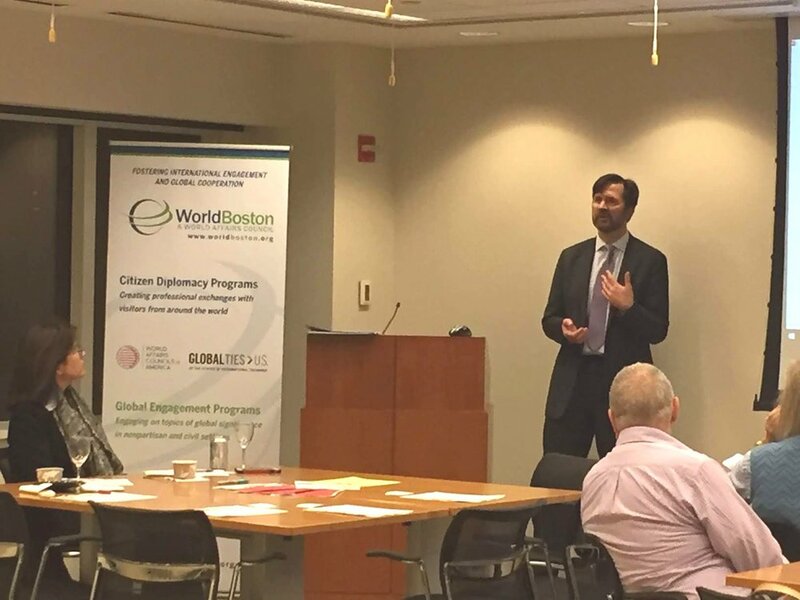 WorldBoston and its members are very grateful for Mr. Thomas Bollyky’s time and for a great presentation. If you are interested in buying a copy of Plagues and the Paradox of Progress, please do so here.